The lesser black-backed gull (Larus fuscus) belongs to the family of gulls, Laridae. The lesser black-backed gull species are distributed in India, Pakistan, Sri Lanka, Middle East, Myanmar, Thailand, China, Africa, Europe, central and northwest Asia and North America. These gull species are fully migratory. These gulls are polytypic species. The lesser black-backed gull (Larus fuscus) is a medium-sized gull, measuring 50 to 60 cm in length and weighing 550 to 1200 grams. The wingspan is 125 to 130 cms. These lesser black-backed gull species take three to four years to reach sexual maturity. The adult breeders have dark gray or blackish back and wings. Rest of the plumage, including head and underparts is white. There are white "mirrors" at the wing tips. 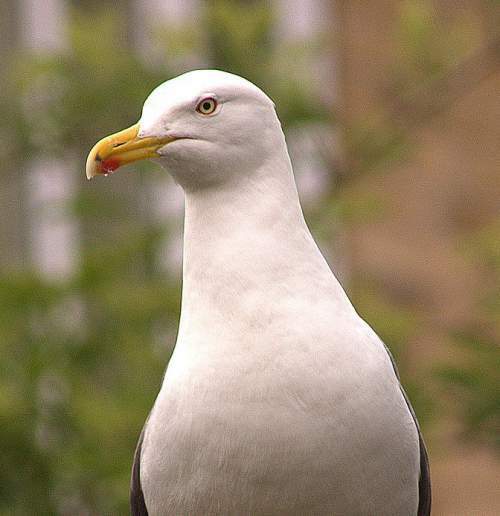 The bill of the lesser black-backed gull is yellow and curved. There is a reddish spot on the lower mandible, which the young peck at, inducing the parent to regurgitate and feed the young. The irises are pale yellow in adults. There is a red eye-ring. The juveniles have blackish irises. The feet are yellow in adults and pale pink in juveniles. The lesser black-backed gull male and female are similar in plumage. Their call is a loud, deep, nasal "laughing" sound. These lesser black-backed gull species are distributed in India, Pakistan, Sri Lanka, Middle East, Myanmar, Thailand, China, Africa, Europe, central and northwest Asia and North America. Breeding populations of these gulls occur in Kazakhstan, Russia, Finland, Sweden, Norway, Estonia, Latvia, Poland, Denmark, Iceland, Ireland, United Kingdom, France, Belgium and Netherlands. In India, wintering lesser black-backed gull species are distributed in the states of Jammu and Kashmir, Himachal Pradesh, Punjab, Haryana, Uttar Pradesh, Bihar, Gujarat, Madhya Pradesh, Chhattisgarh, Jharkhand, Odisha, Maharashtra, Goa, Karnataka and Tamil Nadu. The Important Bird and Biodiversity Areas (IBA) of these lesser black-backed gull species in Spain are Cádiz bay, Pela mountain range-Orellana reservoir-Zorita, Cape Busto-Luanco, Isla Cristina and Ayamonte marshes and Prado lagoon. Some of the IBA of the lesser black-backed gulls in United Kingdom are Alde - Ore Estuary, Severn Estuary, Bowland Fells, Morecambe Bay, Cardigan Island, Little Cumbrae Island, Horse Island and Isles of Scilly. The IBA of lesser black-backed gulls in Sweden are Lövsta Bight – Björn Archipelago, Archipelago of Northern Hälsingland and Archipelago of Stockholm. These lesser black-backed gull species do not normally occur in forest. These species normally occur in altitudes from 0 to 1000 meters. 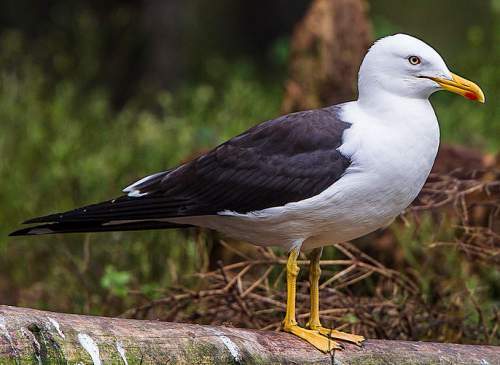 The artificial ecosystems and habitats of these lesser black-backed gull species include cultivated lands, pasturelands, rural gardens, urban areas, water storage areas, water treatment areas, fishing harbors and canals. The natural ecosystems and habitats of these lesser black-backed gull species include coastal lagoons, wetlands, temperate grasslands, freshwater lakes, sea cliffs, rocky offshore islands, freshwater marshes, rivers and streams. The diet of lesser black-backed gull consists mainly of small fish. Aquatic and terrestrial insects, crustaceans, molluscs, worms, eggs and chicks of birds, rodents, carrion, offal and fish waste are their primary food. These lesser black-backed gulls are omnivorous, opportunistic feeders. The also feed on berries, seeds and grains. They may feed from urban garbage dumps and also follow fishing vessels for discarded bycatch. The breeding season of these lesser black-backed gull species is from April to June in most of their breeding range. These gulls are monogamous and breed in colonies. Their breeding sites include, coastal grassy slopes, margins of lakes, sand-dunes, cliffs, rocky offshore islands and islands in lakes and rivers. The lesser black-backed gull nest may be a heap of grass or weeds or a simple sparsely-lined scrape on the ground. Sometimes they nest on cliffs, buildings and rooftops. The typical clutch contains three, ovoid, buff colored eggs with dark brown spotting. These lesser black-backed gull species are mostly migratory birds. Breeding lesser black-backed gull populations occur in northern Europe and northwestern Asia. Small year-round breeding populations occur in coastal Portugal, southern Ireland, the United Kingdom and northern France. The breeding lesser black-backed gulls disperse widely for wintering and move in leapfrog-like stages, using many stopovers en-route. The Autumn migration to the wintering grounds occurs from July to September and the return spring migration takes place from February to June. The global population size of the lesser black-backed gull (Larus fuscus) is estimated to number about 940,000 to 2,070,000 individual birds. The overall population trend of these species is considered to be increasing. Throughout its range, this gull species is reported to be abundant to common. The generation length is 13.9 years. Its distribution size is about 19,800,000 sq.km. Habitat alteration and destruction, avian botulism, sport hunting and capture for pet-trade are the main threats that may endanger the survival of these gull species. 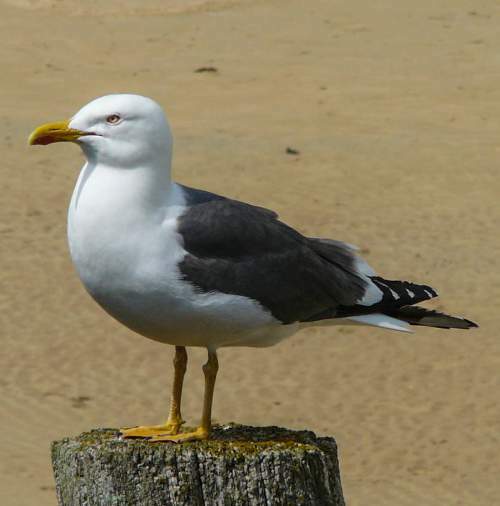 The lesser black-backed gull (Larus fuscus) does not approach the thresholds for being Vulnerable either under the range size criterion, or under the population trend criterion or under the population size criterion. The IUCN (International Union for Conservation of Nature) has categorized and evaluated the gull species and has listed it as of "Least Concern". The CITES (Convention on International Trade in Endangered Species of Wild Fauna and Flora) status is ‘Not Evaluated’ for lesser black-backed gull (Larus fuscus). The lesser black-backed gull (Larus fuscus) is closely related to European herring gull (Larus argentatus) and Caspian gull (Larus cachinnans). The five recognized subspecies of the lesser black-backed gull are: L. f. fuscus Linnaeus, 1758, L. f. graellsii A. E. Brehm, 1857, L. f. intermedius Schiøler, 1922, L. f. heuglini Bree, 1876 and L. f. barabensis H. C. Johansen, 1960. Current topic in Birds of India: Lesser black-backed gull - Larus fuscus.